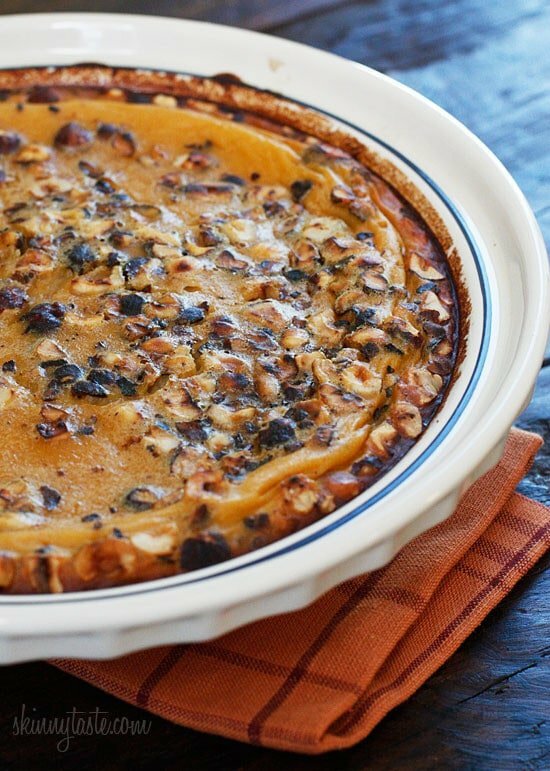 Pumpkin Hazelnut Flaugnarde (Clafoutis) – A warm rustic pumpkin custard sweetened with agave and baked with toasted hazelnuts. This is the perfect ending to a Thanksgiving feast and a wonderful lighter alternative to pumpkin pie. Don’t let the fancy name scary you, it’s actually very easy to make, the only appliances I used were a blender and an oven! Some of my other favorite pumpkin dessert recipes are Skinny Pumpkin Pie, Pumpkin Spice No-Bake Cheesecake and Pumpkin Banana Pecan Bread. I just returned last night from the Foodbuzz Festival in San Francisco, what a great time! Today I’m a little jet lagged and slow getting back into the groove of things. 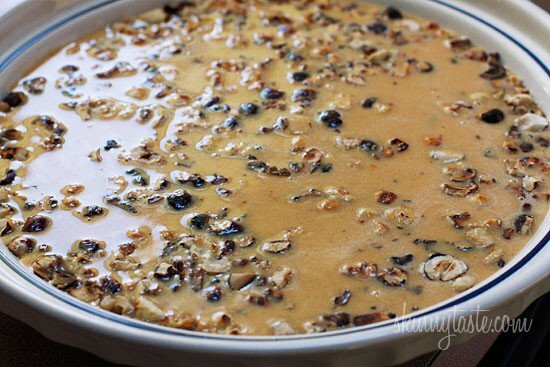 Next on my list of things to make for the holidays was this wonderful dessert that doubled as my breakfast this morning. Who doesn’t like dessert for breakfast, right??? Adapted from my Flaugnarde of Mixed Berries recipe, this is nothing more than a simple French custard-like dessert served warm. The basic ingredients are eggs, milk, and fruit. I love the texture the hazelnuts added to this, you get a crunch in every bite. Chopped pecans or walnuts would also work. If you like your pumpkin desserts heavily spiced, you can increase the nutmeg, ginger and cinnamon. If vanilla bean is not in your budget, just use 1/2 tsp more vanilla extract, although I really love the flavor you get from the bean itself. You can also sub the agave for sugar, Splendia, stevia or whatever sweetener you prefer. 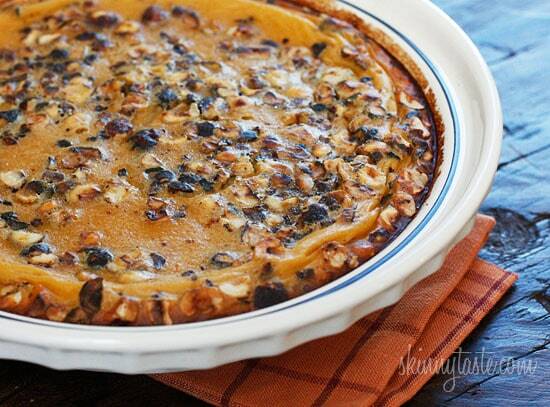 A warm rustic pumpkin custard sweetened with agave and baked with toasted hazelnuts. 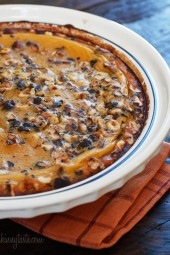 This is the perfect ending to a Thanksgiving feast and a wonderful lighter alternative to pumpkin pie. Don’t let the fancy name scary you, it’s actually very easy to make, the only appliances I used were a blender and an oven! Preheat oven to 425°F. Spray a 9-inch pie plate with baking spray. 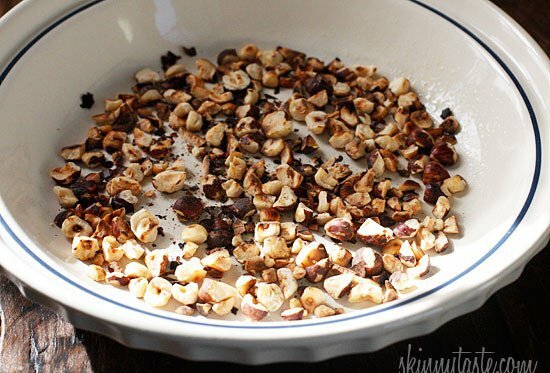 Add the hazelnuts to the dish. Place the eggs, egg whites, agave, milk, vanilla extract, vanilla bean, cinnamon, nutmeg, ginger and salt in a blender (or a food processor). Blend until smooth, about 30 seconds. Add the pumpkin purée and blend well. Add the flour and pulse until well combined. Pour in the batter into the pie dish. Bake for 15 minutes, then lower the heat to 375°F and bake until the center is just set, about 12 minutes.